Next season is looking good. We have a good group of seniors. My best game was against Grant because I rushed for 245 yards an 4 touchdowns. My football idol is Tim Tebow. He is very talented and lives through God. I started playing when I was 8 years old. If football doesn’t work out I plan on going into Engineering. I am being recruited at this time for S. S is my favorite position because I get to hit people and get interceptions. 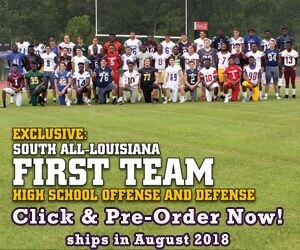 ULM, Louisiana Tech, ULL, and Tulane.